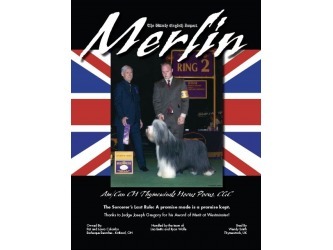 Merlin was our second beardie imported from Thymewinds Kennels in the UK. 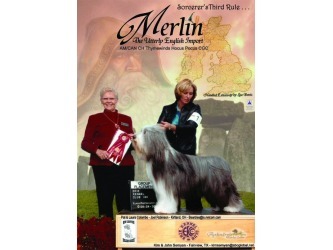 When we traveled to England to pick up our girl, Rhiannon, we saw Merlin’s grandfather. 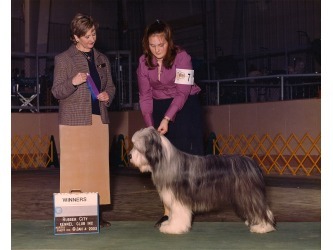 Sunbree Sandy Trail was the most beautiful brown beardie we had ever seen and I was determined to somehow bring his pedigree to the US. 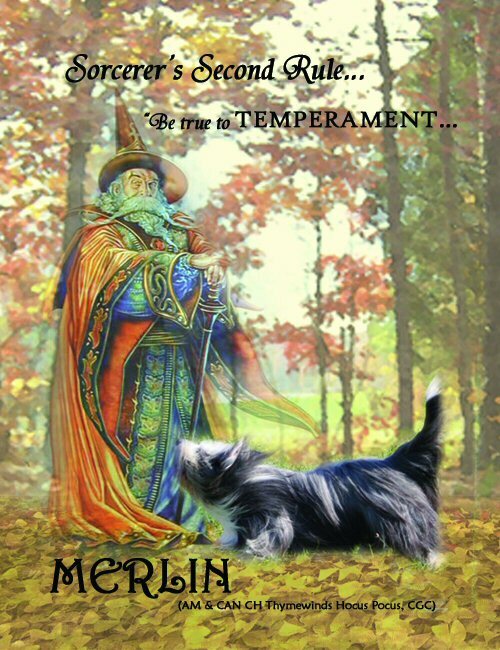 Merlin provided that opportunity and would prove to be a perfect mating for Rhiannon as well. 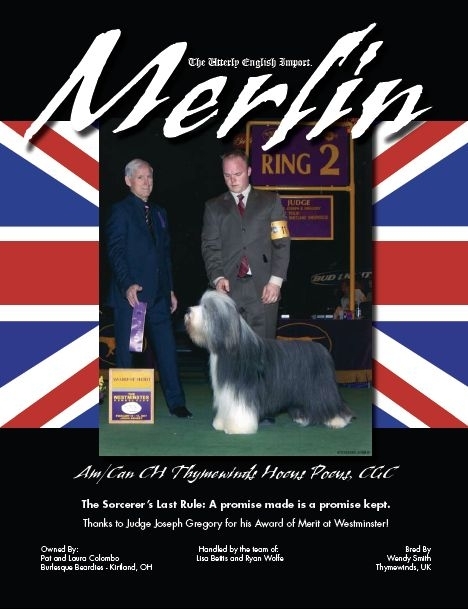 Merlin finished his championship easily and was our first dog to spend time on the road with a handler. 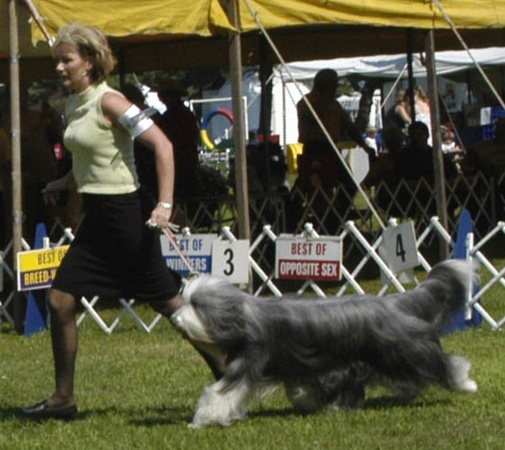 We entrusted Lisa Bettis with him and she moved him into the top ten easily. 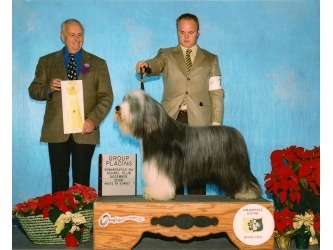 His campaign ended with an Award of Merit at Westminster in 2007. 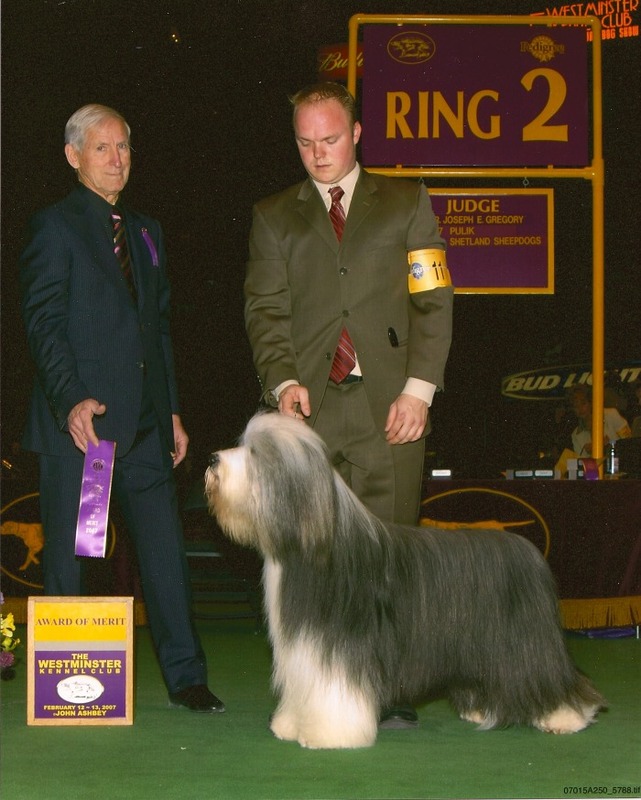 Later that year, our friend David Fruehwald introduced Merlin to sheep and within two months he had earned his PT. 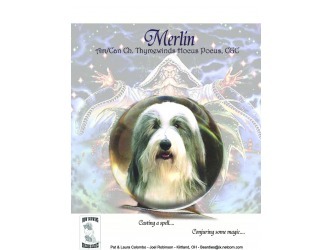 2010-2011 have been BIG years for Merlin! 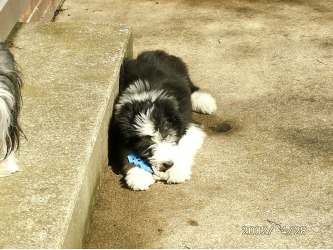 He has continued to show us what a wonderful boy he is. 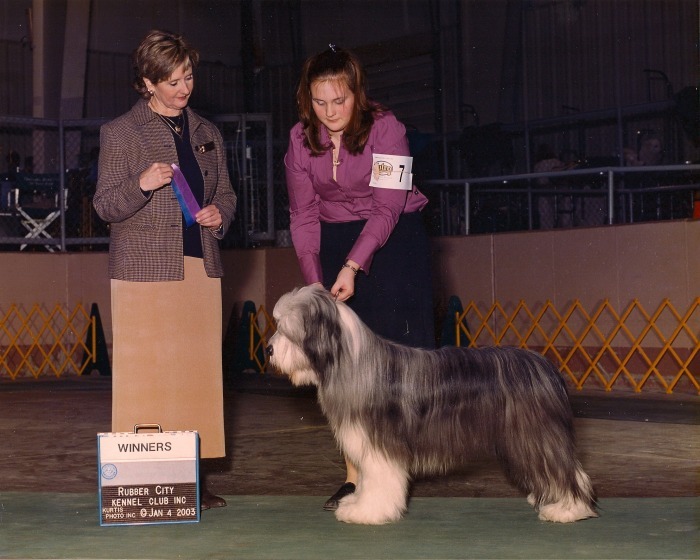 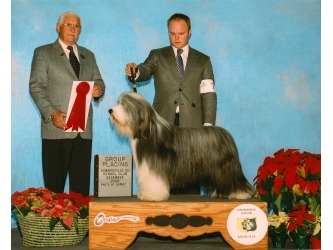 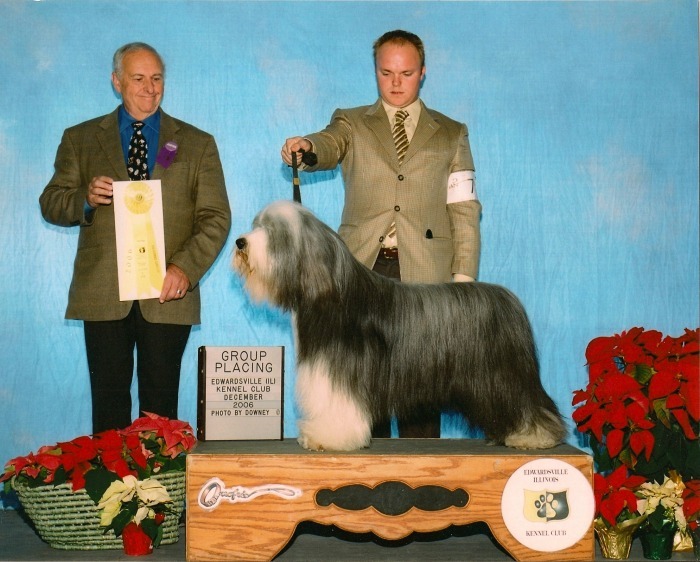 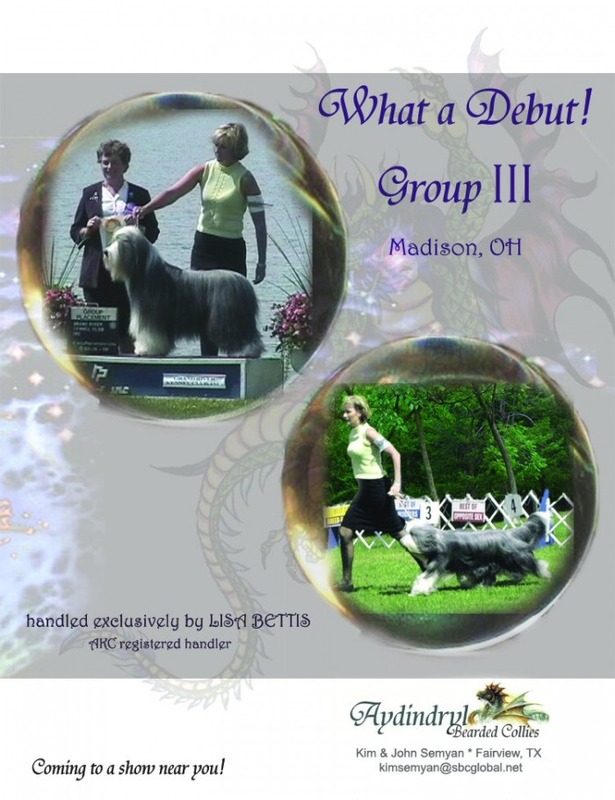 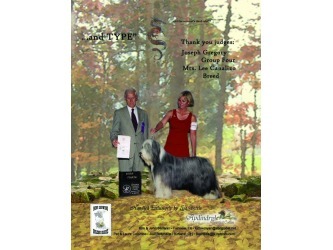 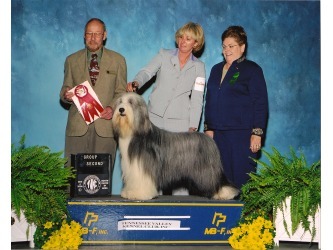 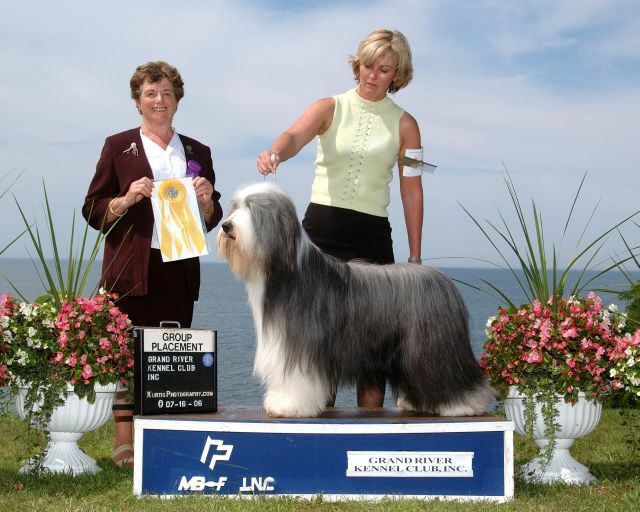 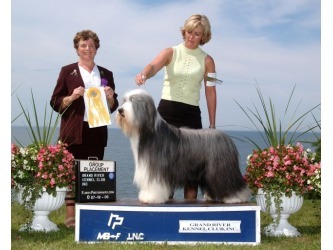 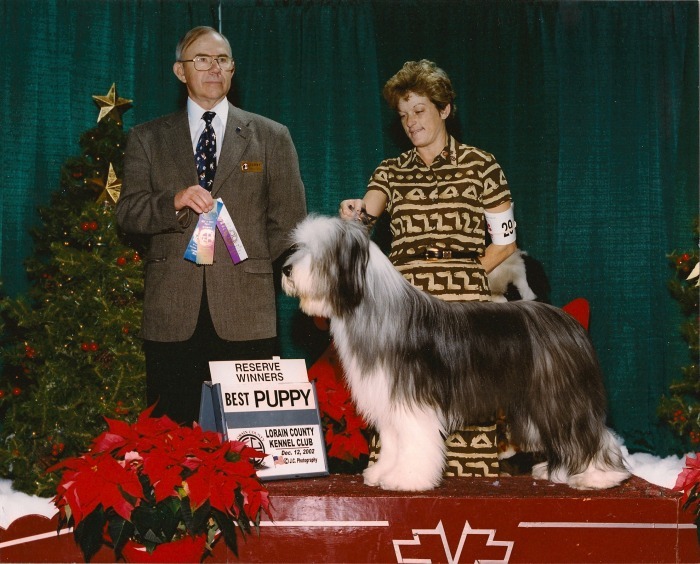 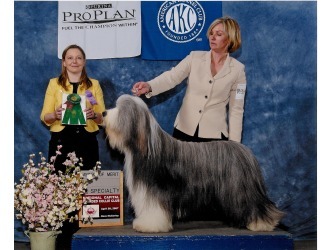 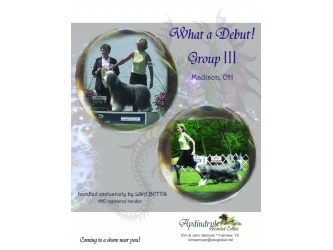 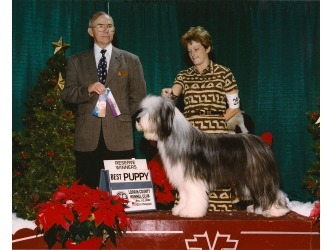 In August 2010 Merlin won Best Veteran in Sweeps at the Bearded Collie Club of Canada National Specialty under breeder judge Cathy Perry. 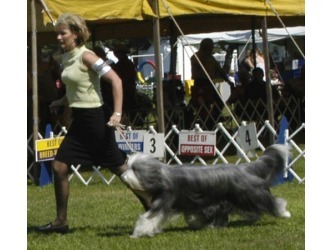 In April 2011 he completed the final two legs to earn his Rally Novice title. 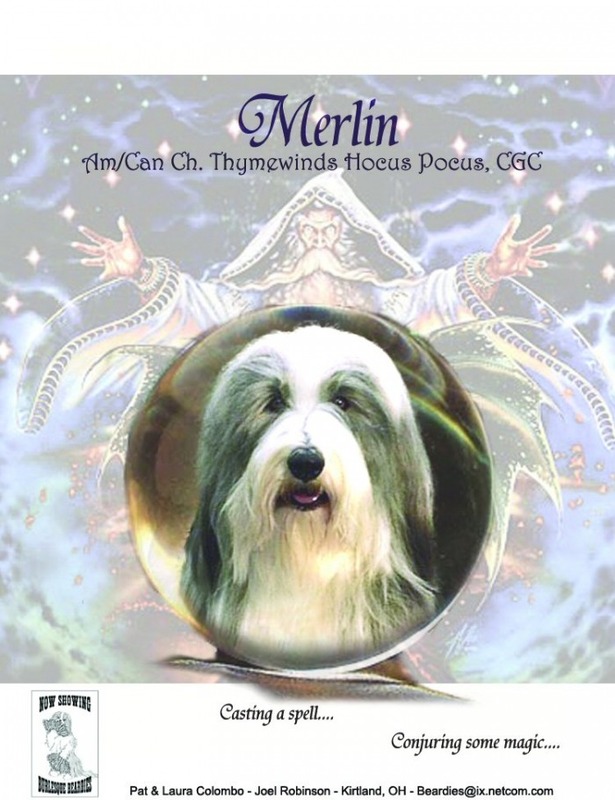 This title was the third piece Merlin needed to earn his Versatility Award. 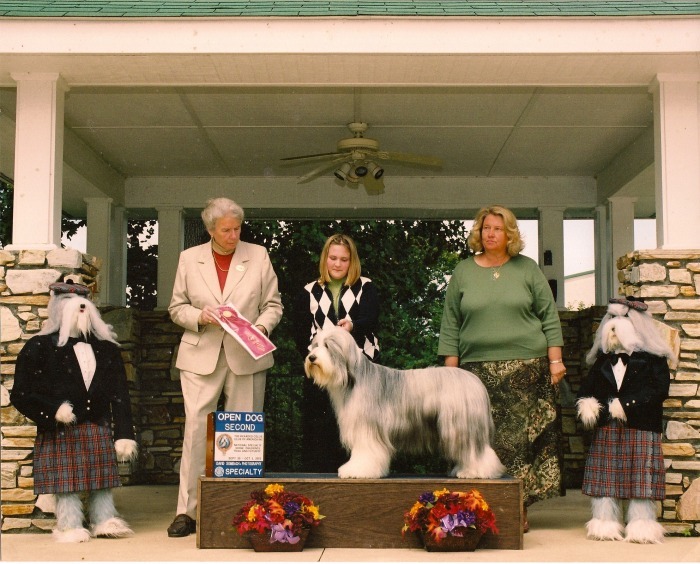 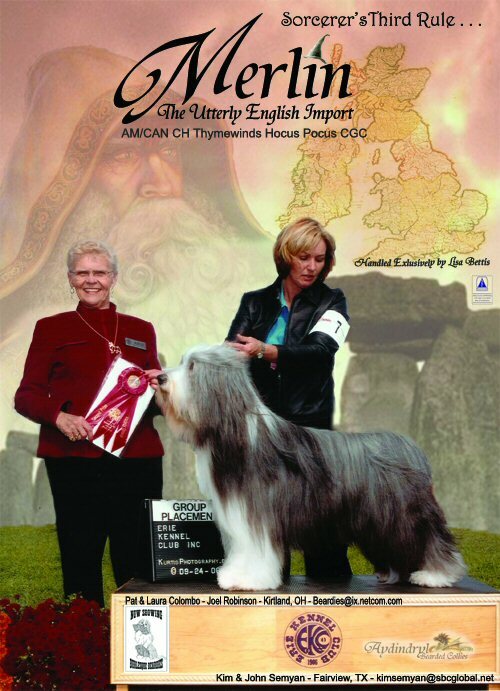 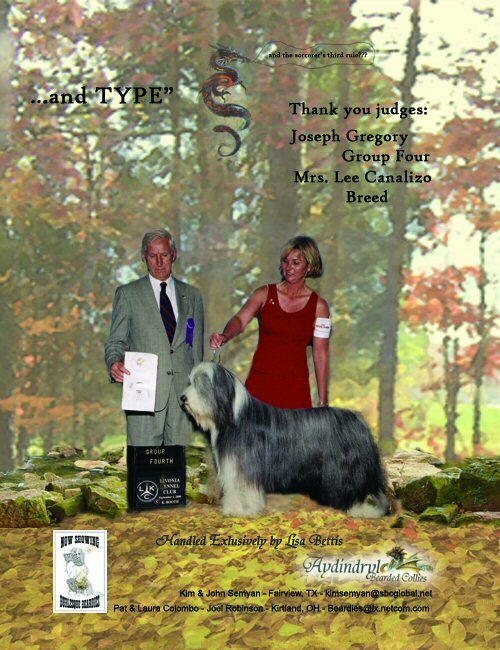 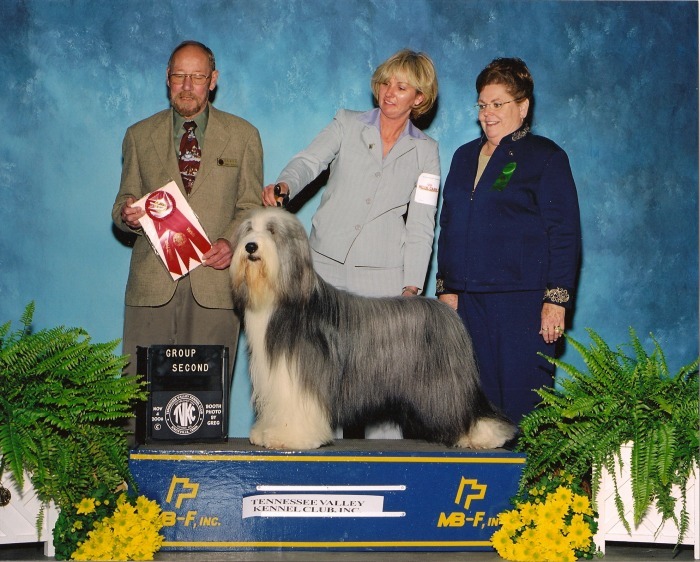 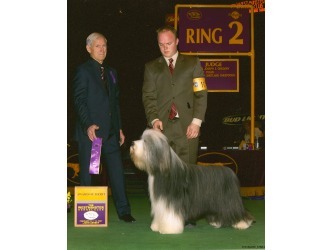 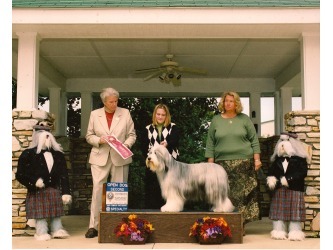 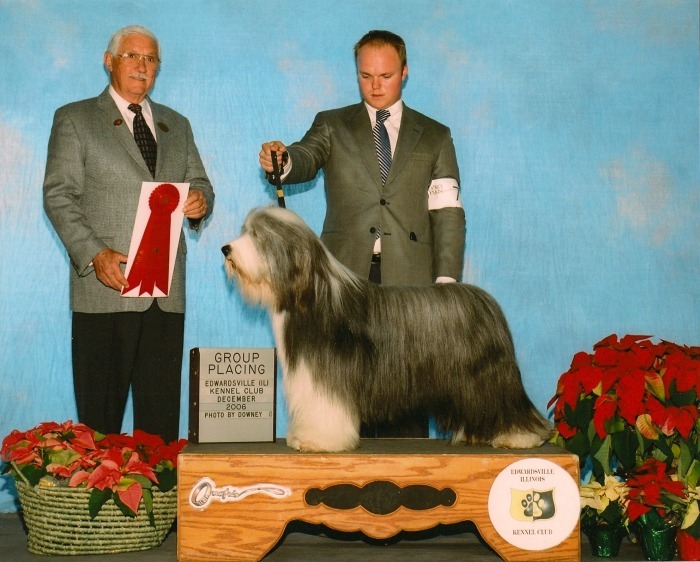 After close to a year hiatus from the show ring, Merlin returned to compete at the Bearded Collie Club of America National Specialty in October 2011 where he was awarded Best Veteran Dog under breeder judge Chris Walkowicz. 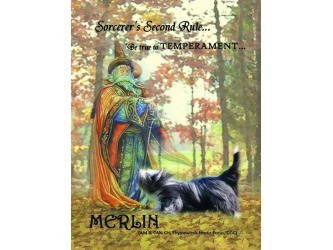 At just shy of 10, Merlin has shown us that he truly gets better with age.